For those of you who were able to get a pair of the Vibram FiveFingers before the hysteric obsession began and back-orders galore, you may be interested in reading this CNN article on barefoot running knock-offs. Chinese counter-fitting companies are copying the shoes, even down to the packaging. What can you do to protect yourself from purchasing a cheap counterfeit? Bottom line, only buy these shoes from an authorized dealer like REI or the official Vibram website. 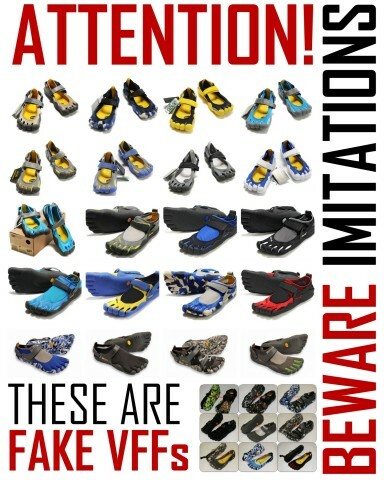 For more info, see Vibram FiveFingers and this post by BirthdayShoes.com on How To Spot A Fake. 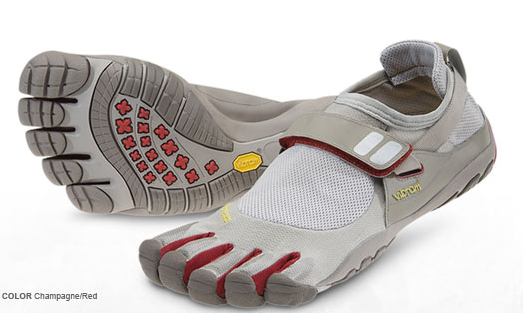 Does this dissuade me from wanting to buy the latest in the Vibram FiveFinger family? No! I can’t wait to get my hands feet on those lovely new trail running TrekSport or KSO Treck, (though I’ll probably get black again). I love you, Vibram FiveFingers! I recently did a review on barefoot running and my favorite athletic shoes I’ve ever owned—you can read it here: Vibram FiveFingers. Thanks! my husband is wanting some… good to know..
Next post: Endurance Running. No Limits.